The Boston Terrier is also called, "The American Gentleman." This is a small and compact dog known to be friendly and quiet, but somewhat stubborn. They are gentle with a happy-go-lucky personality. Their normal weight span ranges from 10 to 25 lbs, and they're usually 15-17 inches tall. 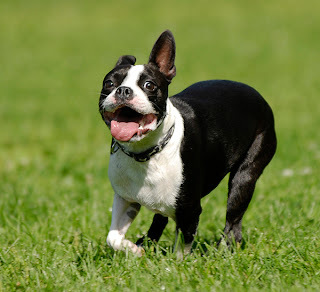 The Boston Terrier is a highly intelligent dog, easy to train.